Overview... a high school educator in Omaha. Jim can't imagine doing anything else with his life. He takes a personal interest in his students' lives during their difficult young adult years, and he takes that responsibility seriously. That's why he can’t believe that this whole student election mess started. All Jim wanted to do was for the right person to win, and more importantly, for Tracy Flick to lose. At some point, a point Jim can’t quite pinpoint, things got way out of hand. Now he might lose everything – including the election. Personality... hypocritical, vengeful, and disillusioned. For all his talk of ethics, Jim is not above stuffing the ballot box or tossing votes to win the election for Paul over Tracy. That's how fed up he is with Tracy and her goody-two-shoes game. There's always a Tracy Flick, every year, and they always get their way. Not this time. Jim McAllister's popularity ranking on CharacTour is #3648 out of 5,000+ characters. See our top-ranked characters and read their profiles. 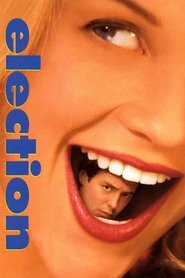 A high school teacher's personal life becomes complicated as he works with students during the school elections.